Just to let you know that we arrived safely & on time as scheduled. There was no delay at Istanbul Airport. But it is such an old fashioned airport. I am busy today with my work & looking at my photos to edit them. All of us thoroughly enjoyed ourselves with the beautiful picturesque sceneries of mountains & lakes with the beautiful Autumn colors & the last 3 days of snow which made us feel so child like playing in the snow…. Thank you for the generous gestures, good food which were not so saltish as the food in Macedonia were much more saltish. The hotels were excellent …very centrally located. I shall catch up with you again. Thank you very much for arranging such a great tour of Bulgaria and Macedonia…. 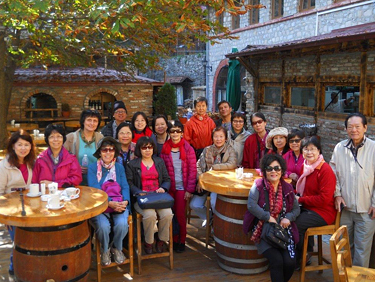 I am sending you attached our group photo with you at Matka Canyon – hope you will enjoy it.